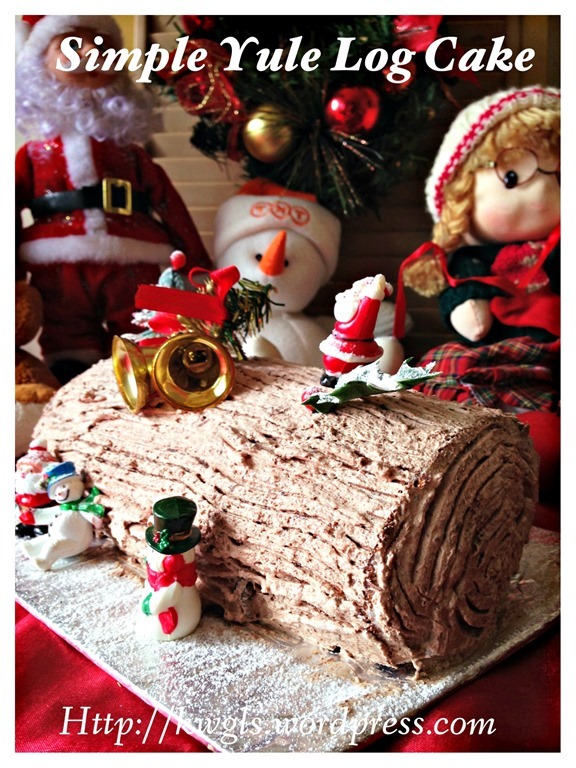 I never believed that I am able to prepare a log cake…It looks difficult and I took out my courage to prepare one today. 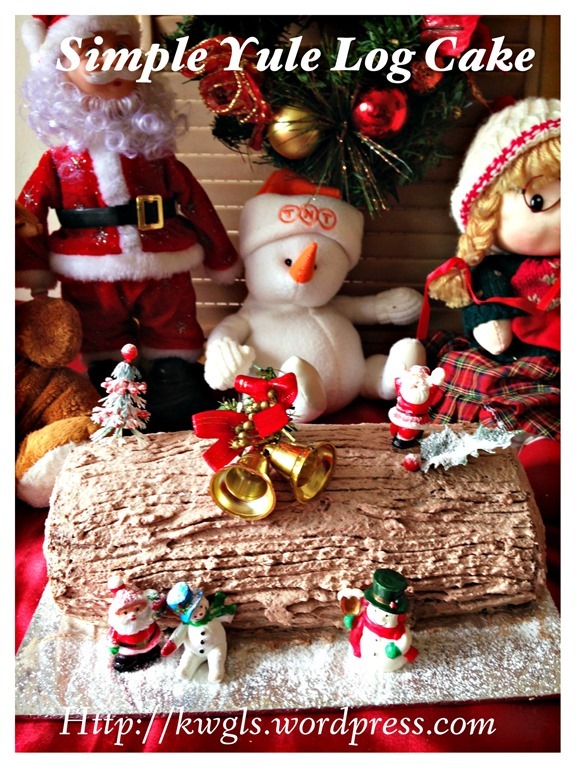 Readers, rest be assured, if I can, you can..and let me share with you some points in an attempt to convince you to put your hands on to have your first log cake. 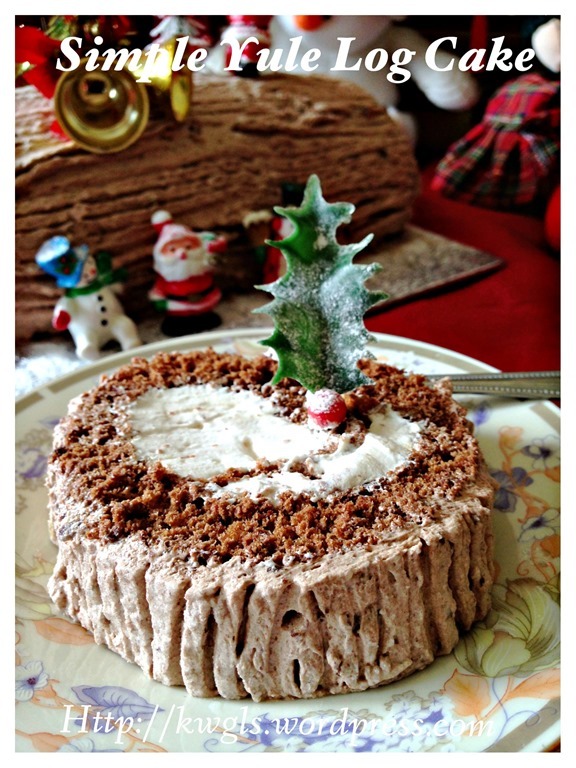 The sponge cake is a very simple and basic recipe… The filling and the frosting are basically the same… And overall, it need less than 10 ingredients to have this log cake. 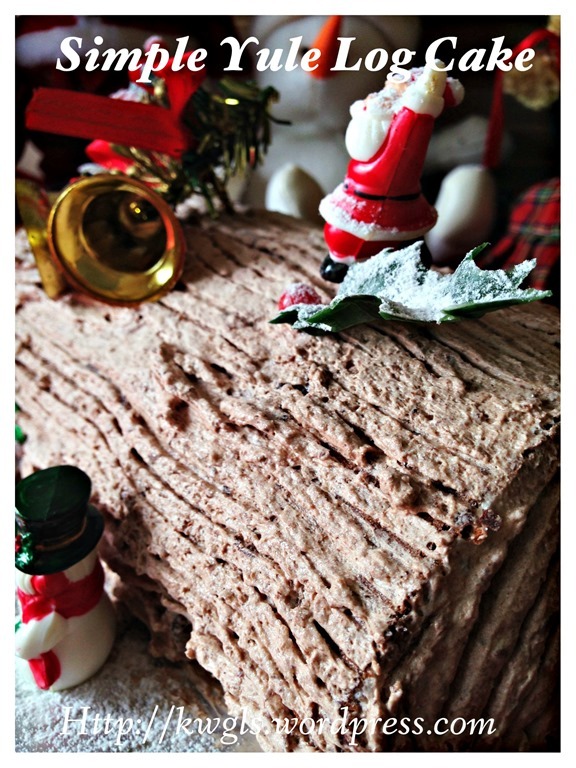 The most it will cost me will be SGD 5….Saves me lots of money ..For taste, it is definitely acceptable though not the best or the finest log cakes compare to those purchased from 5 stars hotel.. However, who really cares after a big feast that were spoilt of many choices of meat dishes, snacks and desserts.. 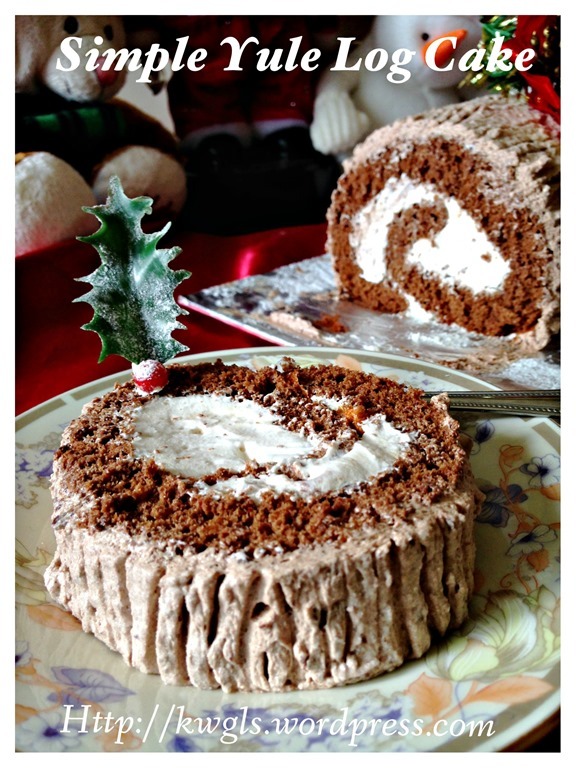 If you think preparing a log cake is very difficult, you have to reconsider again.. You need not to have the softest and finest sponge cake prepared using egg separation method..In my humble opinion, the centre point of the cake will be on the overall mix between the delicious creams and the sponge cake. Therefore what you required is just a basic simple sponge cake that are reasonable soft. You don’t need to possess very good cake decoration technique or complicated baking equipment.. You need to select a frosting of your choice, spread on the cake, there is not even a need to level it because you are going to create a visual effect of tree barks… Any imperfections will be deemed to be natural defect on that piece of wood….In addition, as it “snows” heavily, you can easily covered any imperfections….Therefore, instead of paying 30-40 SGD for a log cake.. why not prepare your own? 1.5 teaspoons of instant coffee granules. 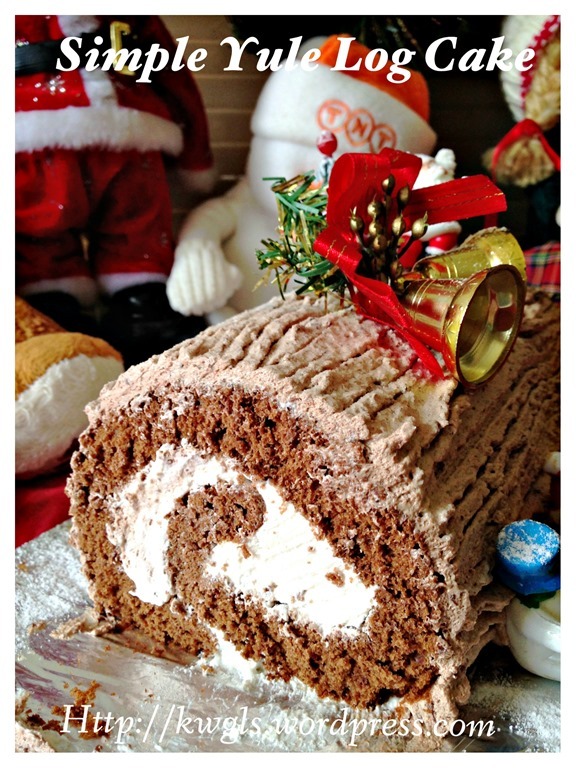 Pre-heat the oven to 180 degree Celsius and line the a 6” x 9” Swiss roll baking tin with baking paper. Beat the eggs and brown sugar at high speed until volume expands to at least twice and become light and pale. 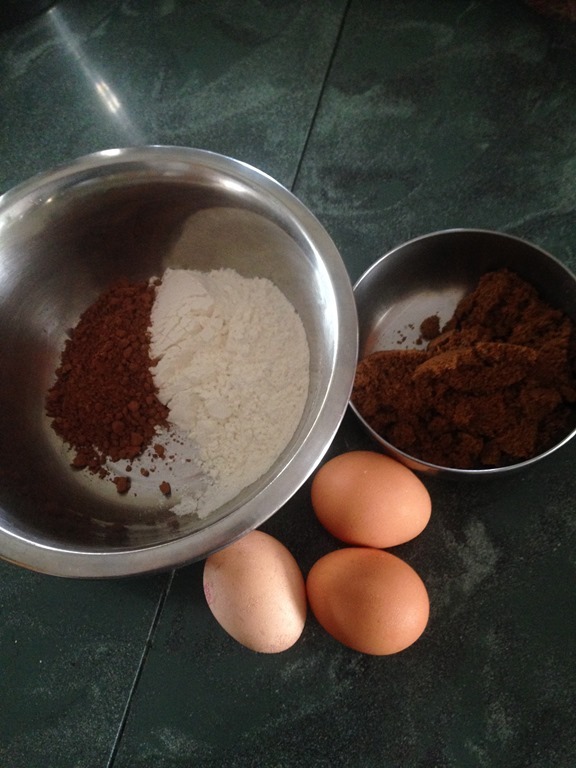 Sift in the coffee granules, cocoa powder and self raising flour. 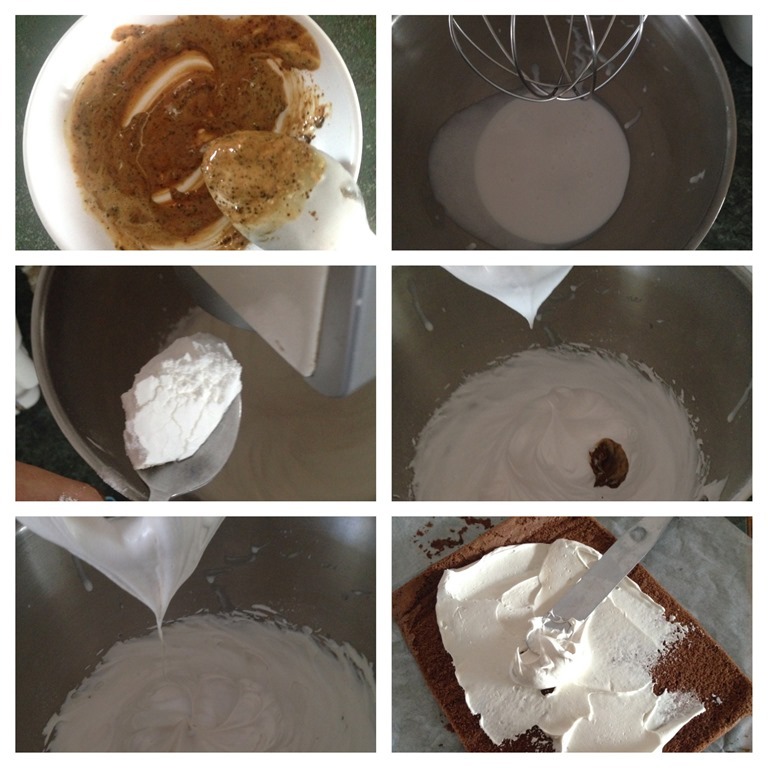 Fold lightly and quickly until it is well mixed. Transfer the batter to the lined baking tin. Lightly knock the tin on the table top three times to force out any air trapped inside. Bake in the pre-heat oven of 180 degree Celsius for 10-15 minutes or until the top is dry. While the cake is resting, prepare the fillings and frosting. 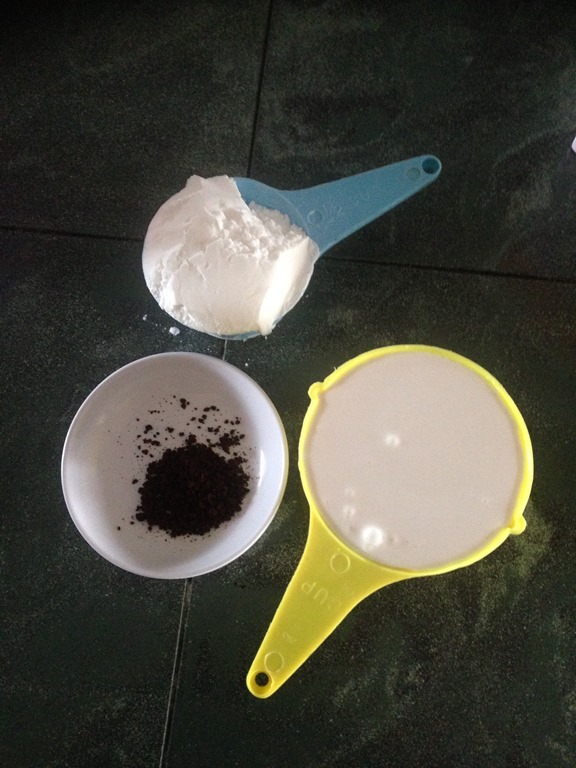 Mix one to two tablespoons of fresh whipping cream with the instant coffee granules. Stir until dissolved. Beat the cold whipping cream until it starts to thicken and volumes starts to expand. Add icing sugar tablespoon by tablespoon, followed by the dissolved coffee cream . Beat until the cream reached a stiff peak. (Please keep an eye on the beating process and in the event that you have overbeaten the cream (whereby the fats separated and floated on some water), try adding some more cold cream and continue to whip so as to salvage the situation. Unroll the cool sponge cake and spread generously a thick layer (about 1/2 of the beaten cream) of beaten coffee cream on it. 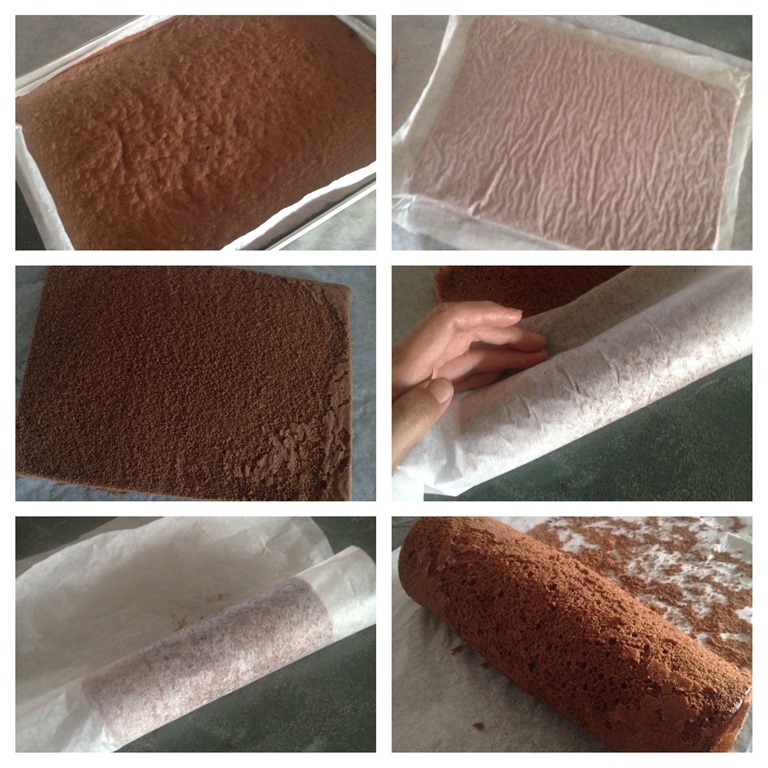 Carefully roll back the sponge such that it is in a log shape. For the remaining cream, add the melted chocolate (melted chocolate should be cool but yet to harden and you can melt the chocolate by microwave for 30 seconds or over the stove over a pot of hot boiling water), quickly use a spatula to fold it until well mixed. 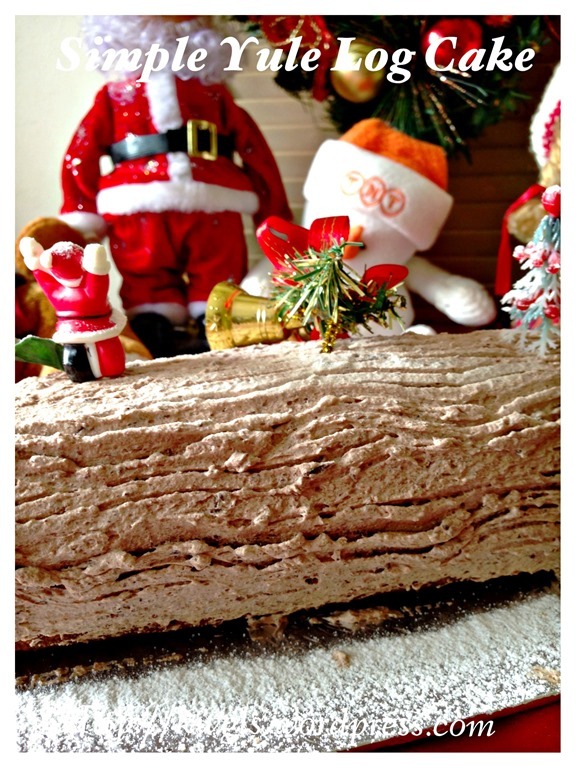 Spread generously the chocolate cream on both sides of the log ends and log trunks. Use a fork to lightly make some horizontal lines on the trunks and circular lines on the log ends. 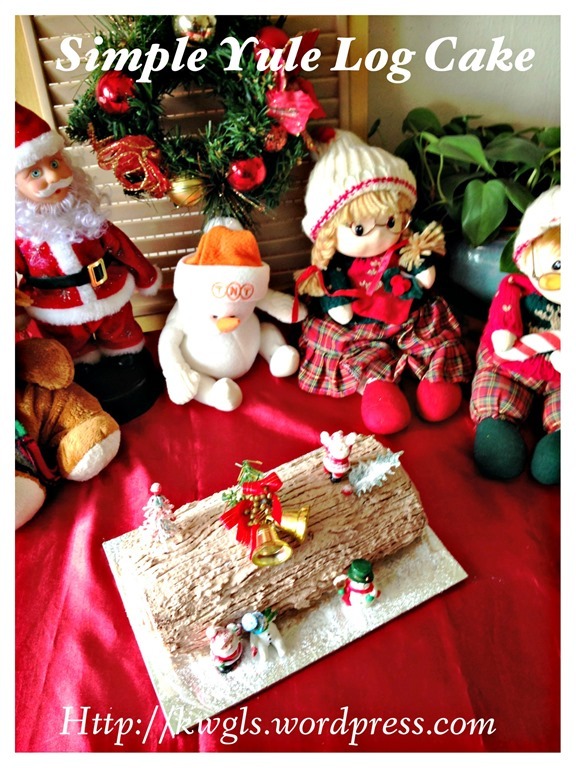 Decorated your cake with your desired Christmas ornaments such as Santa Clause, pine tree, mushrooms, reindeer etc.. and dust sparingly with icing sugar resembling snowfall. 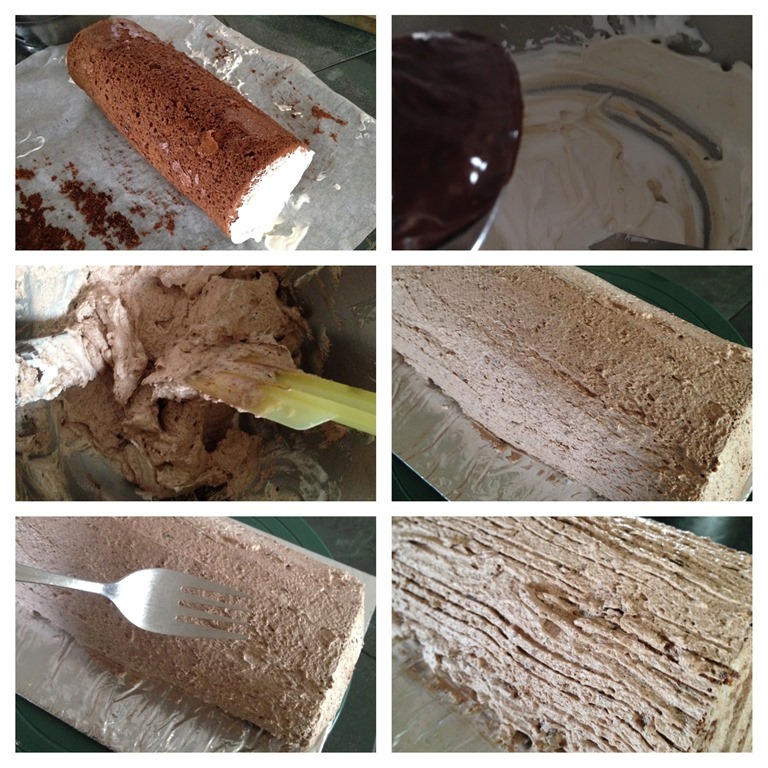 Chilled the cake if the frosting is too soft and cut into 2 cm thick pieces for servings. 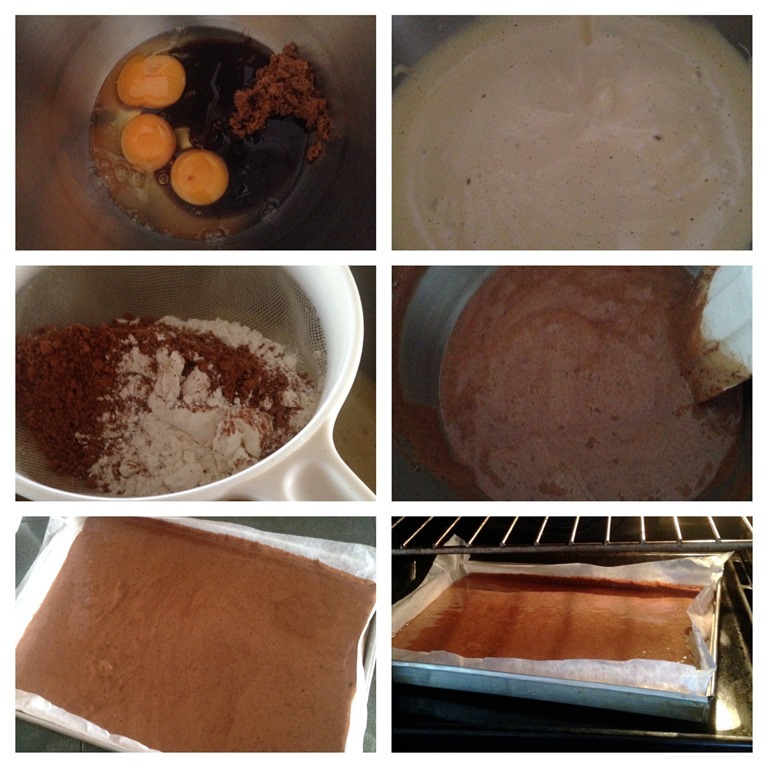 It does not matter if your basic sponge cake is ugly as it will be fully covered with coffee cream. It also does not matter if you cream and frosting is smooth as after drawing lines with forks, it will have a natural tree bark look… I have used less chocolate in this illustration so the colour is a bit light. 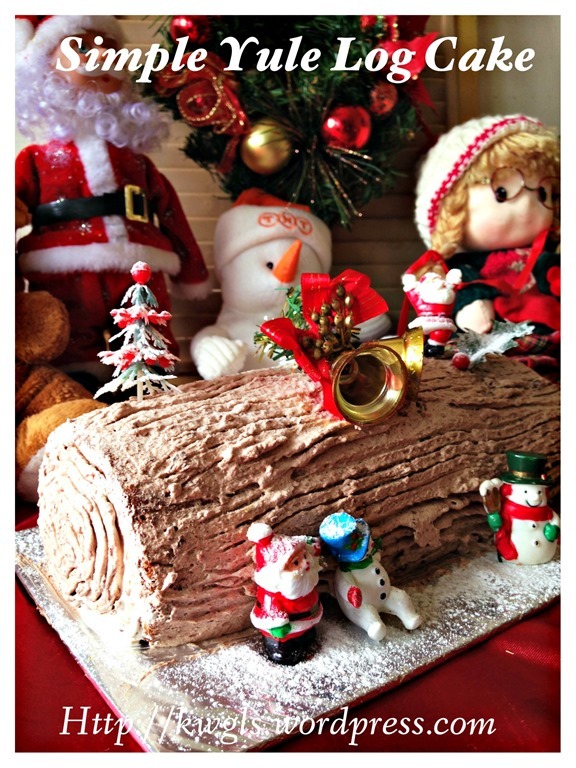 You final log cake should have a darker and more appealing colour. 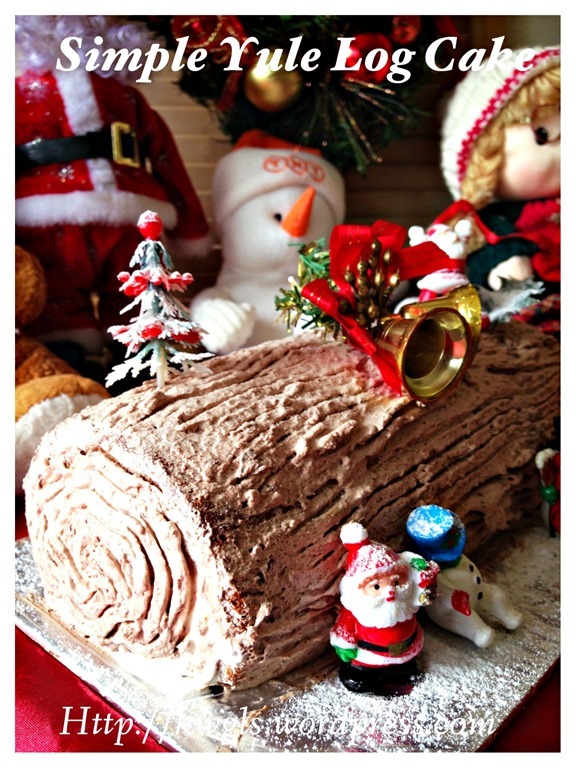 Trust me, I can do it, you can do it… If you think that it is a miracle that you can prepare a log cake, the miracle is going to happen. 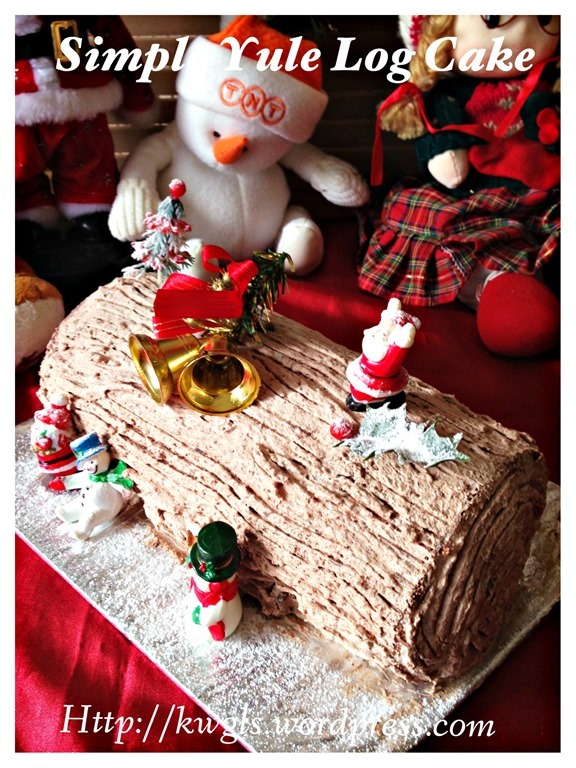 Remember that the beauty of a log cake is that it need not be perfect, be it your decoration or sponge cake… New bakers, do take a step to make this simple Yule chocolate log cake and impress your guests. 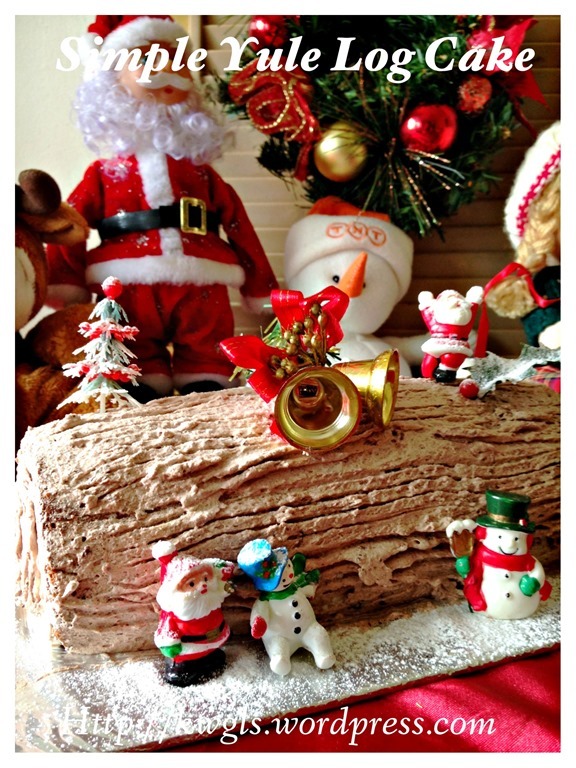 This entry was posted in Cakes and cookies, Christmas, Christmas 2013, Desserts, Food Preparation Series and tagged 8, bûche de Noël, chocolate yule log cake, Christmas 2014, GUAI SHU SHU, Guaishushu, kenneth goh, postaday, yule log cake, 树桐蛋糕. Bookmark the permalink. Hi, may i know is instant coffee granules the instant 3 in 1 coffee? Or those 2 in 1 coffee bag (kopi o) ? Mine is in a bottle like nescafe. You will need to put your milk and sugar etc.. Only that, the taste will be stronger. Oic… OK tks! I dun drink coffee, but now I know what u meant. Tks!